Nothing says summer like fresh cherries from the tree, or a delicious cherry pie! Many sweet cherries are self-fertile, but a few do need pollinizers. If your chosen variety needs a pollinizer, almost any other sweet cherry will work, with the exception of Black Gold, which blooms later than most sweet cherry varieties. 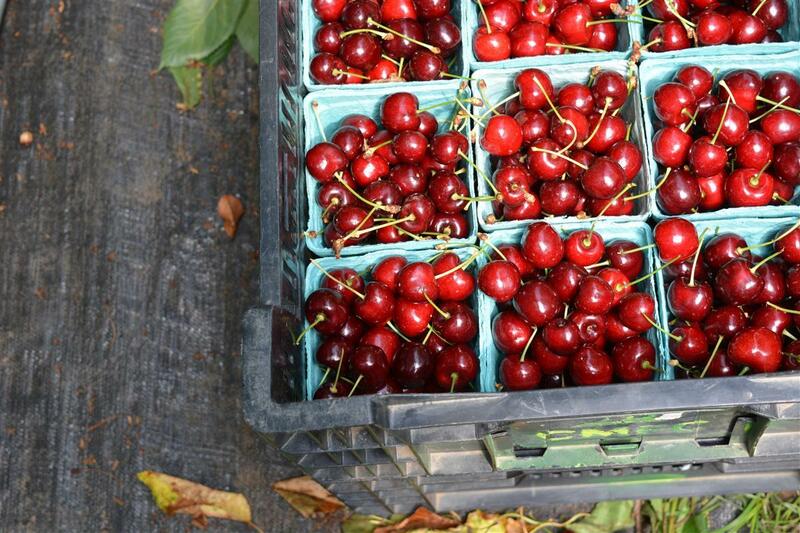 Tart cherries are self-fertile, but bloom later than most sweet cherry varieties so don’t work well as pollinizers. Cherry trees are only shipped while dormant, from February through early April. They are available for pickup from February through late November. The growth habit on this rootstock is more spreading than upright, a desirable trait for cherries. Anchorage is only fair, so staking is a necessity. Remember the stake is extremely valuable for tying up branches at young age that are laden with fruit. 10′ spacing. Properly maintained it can easily be kept under 9′-10′. Also suitable for trellis training, including UFO Cherry Systems. Falling in between Gisela 5 and Mazzard in size, Krymsk 5 is a precocious rootstock with good anchorage and some tolerance of wetter soils. Unlike Gisela, productive varieties will not overset and produce small fruit on this rootstock. Trees can be maintained at a 12′-15′ size, should be spaced 12′-15′. A semi-dwarf rootstock that is more tolerant of heavy or wet soils. Vigorous sweet cherries on Mazzard will become large trees if not pruned. Well anchored, so only initial staking needed. Properly maintained trees can be kept to 15′-18′. Limited varieties available.